Hi everyone! I’ve created a birthday card using the super sweet Party Pals from Avery Elle. The small birthday sentiment is from the Shine Bright stamp set and was heat embossed using white embossing powder. I cut out the grassy border using the Picket Fence Elle-ments die set. 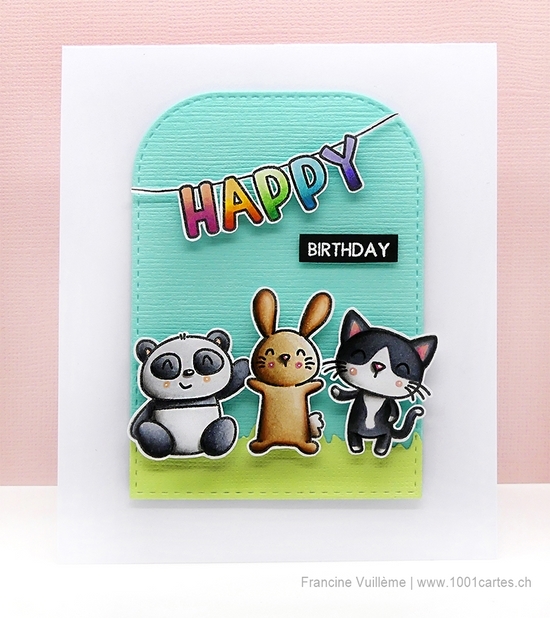 Super cute critters, Francine! Beautiful Copic coloring, as always, and I love how you created an ombre effect with your die cut alphas! I also love all the texture on the aqua panel...darling card!